Finding the right mix of technical and management skill is difficult. Couple that with the need for a strong work ethic and similar core values to your own and the talent pool is limited. 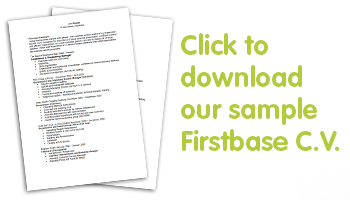 First Base have experienced consultants dedicated to filling Senior Appointments. We have decades of experience in networking and providing targeted headhunting campaigns. We will shortlist only those candidates that we know, having met them, will align with your business needs. We have a team of industry specialists with intimate knowledge of their markets, ranging from Professional Services, Aerospace and Energy to Distribution & Logistics. 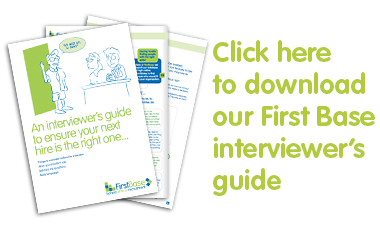 First Base staff are easy to deal with, professional and confidential in their approach to recruiting on your behalf. We will always discuss fees up front and will liaise with you on which basis you would like to employ; permanent, project or interim. We will work with you to ensure a hassle-free solution whilst working to your budget and timescale. We’ll organise a confidential meeting, at your convenience, to discuss your requirements and get to know you, so that we can develop a recruitment strategy designed to source only candidates of relevance for you. We offer a guarantee on all of our candidates, if they’re not a good fit, you are protected by a rebate facility. We’re also incredibly flexible so if your business’s needs change, we will refine our search to reflect your requirements. Established in 1997 we have strong connections across the local network. We have one of Gloucestershire’s largest databases of top quality candidates and jobs. Decades of experience vetting prospective job applicants and finding the right fit. We save time, money and resources finding you the perfect fit. We have specialists with decades of experience in sourcing those difficult to find vacancies for our executive candidates. Few companies publicly advertise their Senior Appointments so it’s important to ensure you’re well represented. We are committed to finding positions suited to you and we won’t recommend positions that don’t make full use of your industry experience and qualifications.